This article shows an example of the US Navy providing Navy specific content to sailors on hand held devices. The folks over at Fleet Forces Command "Get It". The application they have developed, titled "Navy IA", is nice. It provides good content, including videos and books on the Apple iPhone/Touch platform. That said, the application itself isn't stellar. It is functional, has a few bells and whistles (videos) and also needs some work (Landscape when reading documents is a must have). The really important thing about this application is that it can be used when disconnected from the network AND it can be used on the sailor's schedule, which is quite different from the average employee's. For years the Navy has struggled with how to train sailors while afloat. There has been plenty of money spent and efforts to try to deliver training content to sailors. Overall the programs, including the Distance Support efforts and the Revolution in Training programs have been successful. That said, the problem, afloat at least, has been an individual sailors ability to get to an available computer, with the required connectivity to access the Training systems. It's not that the Navy hasn't tried. It's just a reality of an operation that relies heavily on a very limited amount of computers and even more limited connectivity. As you would expect, the Navy ship requires that "Command and Control" systems get priority on the available computers and bandwidth. That leaves a very small amount of bandwidth available for Non-Command and Control usage. 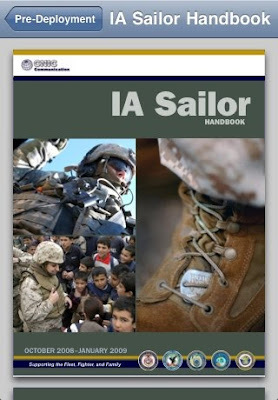 Using the "Navy IA" application as a model, the Navy could move a considerable amount of training to the Apple iPhone/Touch platform. Imagine if the required annual refresher training for "Sexual Harassment", "Trafficking in Persons", and "Information Assurance Awareness" could be completed by Sailors via a hand held device. Imagine if it could be done without having to secure time on a very over-subscribed PC, at odd hours, when a desk is available. Given the amount of time and effort (translated into $) spent completing these courses, my guess is that the Navy could purchase an Apple Touch for every new recruit and load it with Navy specific classes. Later, you could also drop on all the technical manuals needed for the different specialties, weapons systems, etc.